CT Bone Density – Wayne Radiologists, P.A. What is a CT Bone Density and how does the process work? A CT Bone Density scan enhances the accuracy of calculating your risk of breaking bones. A CT Bone Density scan uses x-rays to measure how many grams of calcium and other bone minerals are packed into a segment of bone. 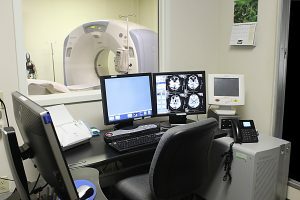 A CT Bone Density scan is performed on the CT scanner. The technologist will instruct you to lay on the CT table and a quick scan of your lower back is performed. The scan requires no prep, and takes about 5 minutes to complete. It is best to wear comfortable loose-fitting clothes that have little or no metal around the waist. There is no prep necessary for this exam. Medicare and some other insurances cover a CT Bone Density scan every 2 years, however coverage varies depending on your plan’s benefit package. Please check with your insurance company before your scan to make sure it is covered. You must have referral from your physician to schedule an appointment for your CT Bone Density. Please have your physician contact our office for an appointment. Technologists are not allowed to give exam results. A written copy of the results will be sent to the doctor who ordered your exam within 24-48 hours.